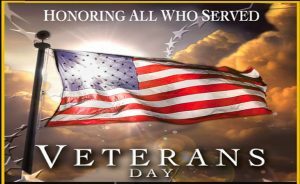 This is part two of a feature series to honor those who served our country as we celebrate Veterans Day on Sunday, Nov. 11. We are proud to take this time to remember those who have fought in the service of our country, living and deceased, and who allow us to live as free Americans because of their dedication. By the way, this year is the centenary anniversary of the last year of World War I. Thank you, so much, to all who have served. Ironically, one of the things Ed Vick liked most about Boca Grande when he and his wife Stephanie first came here 17 years ago was that it reminded him of Vietnam. A Naval officer prior to his business career, Ed served in Vietnam with the River Patrol Force, made notorious in “Apocalypse Now.” He led over 100 combat missions on the shallow and narrow waters of the Mekong Delta. Among other awards, he and his River Division received the Presidential Unit Citation, the highest honor an American unit can receive for its actions in combat. He also personally holds two Bronze Star Medals with Combat “V”, the Combat Action Ribbon and the Vietnamese Cross of Gallantry. Ed has long been active in veterans’ causes. He was the first chairman of Iraq and Afghanistan Veterans of America, the largest nonprofit organization dedicated to improving the lives of those veterans. He also served on the board of Give an Hour, which provides free mental healthcare for veterans and their families. His boat here on Boca Grande is waterjet propelled, just like his boats in Vietnam. “I can’t even drive a prop boat,” he admits sheepishly. Stephanie and Ed reside in Boca Bay. Both are active on the island, and Stephanie chairs the Woman’s Club’s Scholarship Committee. Originally from West Virginia, James C. Dieffenderfer came from a coal mining family and entered into military service just prior to the attack on Pearl Harbor. He served in Panama and New Guinea, to name two locations, plying missions in B17s. He was called “The Old Man” because he was 26, and he flew 46 missions in the Pacific. He was involved in the Battle of the Bismark Sea, one of the turning points in the war. He went to the Pentagon after the war and became head of aerospace research there. He is the father of Boca Grande resident Ann Fletcher. Dad has served our country since his youth, and his service has always been a source of pride for our family. He learned to fly with the Army National Guard, served in Vietnam flying Huey ground support helicopters, and then joined the United States Coast Guard as a Search and Rescue pilot. Heʼs saved desperate Cuban refugees seeking freedom in rickety life rafts off the Florida coast, com- mercial fishermen in the Bering Sea off Alaska, and weekend fishermen who have found their way into trouble in the Gulf of Mexico, among others. After retiring from active duty, he served for several years as Deputy Chief of Boating and Safety for the USCG Auxillary. The uncle of Boca Grande resident Kathy Futch, Matthew Iaquinta served in World War II in the 101st Paratroop Division and perished over Normandy on D-Day. He is the namesake of Kathyʼs son, Matt. In the spring of 1942, my 19-year- old brother, Jim, enlisted in what was then the Army Air Corps basic train- ing in Enid, Okla., and Texarkana, and then off to Barksdale Field, La. to learn to fly the B-26 Martin Marauder. He flew the Atlantic, then on to Africa to join the 34th Bombardment Squadron. After having helped push Rommel and the Afrika Corps out of Africa, the 34th supported the landings in Sicily and Italy and then relocated to an air- base in Sardinia. From that base, missions went regularly to Casino, Anzio, bridges over the Poe River and German troop concentrations. Originally the quota for air crew rotation home was 30 missions, then it became 40, 50 and 60. The crew of the Laura June (Jimʼs plane and a terrible name for a warplane) stood down for transportation home after 60. Unfortunately, the Wing Commander asked Jim if he would personally volunteer to stay on a short while due to a shortage of experienced pilots to lead bombing raids. My mother and I were home in Chicago on July 28, 1944 when we saw the Western Union man get off his bike in front of our house. Everyone knew what that meant. At the time hundreds and some- times thousands of these telegrams went out. We subsequently got a let- ter indicating the Laura June had been hit by a shell from a German 88 on the bomb run, knocking out the left engine. Jim dumped his bomb load and headed back toward Sardinia, but with mountainous terrain to cross. A number of months later we learned that as the American Army advanced up the boot of Italy, Graves Registration found Jimʼs remains and those of the other officers on the Laura June in a common grave in a German military cemetery. They were removed to a U.S. cemetery and seven years later returned to a central location in the U.S. in Louisville, Ky.
Aviation Mechanic Casimer P. Kania enlisted in the Navy in 1943, in his senior year in high school. He was stationed with the carrier, “USS Forrestal.” Kania is the father of Angela Steffan of Boca Grande.